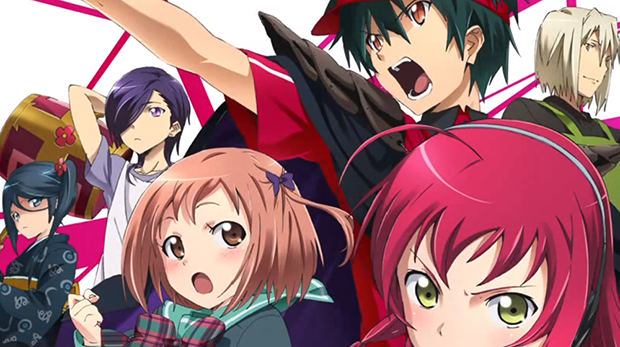 Home » Articles » Anime Review: The Devil is a Part-Timer! Anime Review: The Devil is a Part-Timer! The Devil is a Part Timer! Is an anime with a lot of potential, unfortunately I believe it fell a little short. Based on a light novel series of the same name, this series chronicles the fall of the demon lord Satan Jacob in the alternate world of Ente Isle. Upon his defeat Satan and his general Alciel travels to our world, stripped of his powers and now in the form of a young Japanese man named Sadao Maou and Shiro Ashiya respectively. Finding this world doesn’t have magic the way Ente Isle has in abundance, they instead learn how our world works in the way of power, prestige and glory. Satan decides his path to glory is to start small and work his way up as an employee at a chain fast food restaurant. And it gets worse. As the portal to our world closed, the hero who defeated Satan, Emilia Justina, came along in pretty much the same predicament. She took the name Emi Yusa and works as a call center agent. Her main goal with following the demon king is to ensure his destruction for the war that has laid waste to most of Ente Isle. When they finally meet it’s more along the lines of a stalemate since both of them need to reserve whatever magic power they have left in the chance they can get home. But all is still not as it seems. Unlike his vicious and warlike tendencies back during the war, Sadao is a hardworking, earnest and likable young man who quickly rises to assistant manager by being the most exemplary employee ever to man a register. His subordinate at the job, a high school girl named Chiho Sasaki, is so impressed by his gentle and professional manner she quickly develops a crush on him. And so it goes. What would normally be a set up for a quick comedy sketch is put into thirteen episodes that start rather strong and have a rather unbalanced run. The opening episode seems to tell us that yes, this is going to be a rather cute comedy with a touch of romance, slapstick and for the inclined, some fan service. It seems that the formula is going to be that someone from Ente Isle will show up, complicate life for our main characters, a lesson is learned and all is right with the world. This would have been fine, until they added too much to the mix. Almost every antagonist finds themselves attached to what should have been a short roster of characters on our side of the dimensions. I am certain the light novel expands on this greatly but the anime doesn’t seem to have time to flesh out certain aspects that it presents. For example, two characters are introduced as allies of Emi. It is hinted that in the upcoming episode they will be major players in what unfolds on this side of the dimensions. Nope, all we get from them is some posturing as the battle ends and perhaps a cameo or two as a kind of “help line” for Emi as she struggles to figure out Sadao’s motivations. They are so insignificant to the plot and yet they are in every opening animation. And just about everything about Ente Isle is shoehorned in as an afterthought. These grand declarations of plots and double plots that have little bearing to the subject matter of the Devil working as a mild mannered fast food drone at all. Each inkling of politics and intrigue are at the expense of the backstories of the women from Ente Isle, providing nothing more than perhaps the elusive “moe” feeling every anime is obligated to include now of days. These characters are simple enough we don’t need the drama left behind on Ente Isle to create tension. The real strengths of this show shines through when it sticks to the premise, but when it tries to make itself something more than a comedy it goes too far and leaves you scratching your head and confused. On the technical side of things the voice acting is adequate for the subject matter. There is no apparent forcing of an overly squeaky or annoying voice to any character, and the voices they use for any incarnation of our characters feel natural rather than over the top. On the English dub side of things they went the extra mile to remake an entire new language for those from Ente Isle from scratch. It’s only a cypher of English, but it’s an attention to detail that didn’t have to be there. They even include a nice extra explaining the process of creating the language and how it was implemented by the voice actors. The opening music really gets you ready for a fun time with a side order of demon fighting, but the ending animation seems slow and out of place for this upbeat series. The animation isn’t the best in the world, and it really shows with some of the backgrounds. Several of them look rather rushed and even blurred for a kind of out of focus effect that really doesn’t work. Character design seems to be off a kind of normal, everyday checklist. And that fits the humor plot, looking average fits with the storyline. It’s no good if the devil looks odd or everyone retained their fantastic features from Ente Isle. The only main character who really stands out is Chiho, who may be a sixteen year old girl and a little on the short side for that but she has the ever present large chest you need on a character to fulfill the Japanese “funny” breast comparisons. Some of the secondary characters are more diverse but they’re just shoehorned in this short series so it makes no difference. I can’t say I would recommend this series. Perhaps it could be used as some background noise on a streaming site like Netflix or the like. Ultimately the promise of a few laughs is sunk by the anchor of drama they attach to this story. It tries too hard to be everything to everyone, and leaves everyone with nothing. The comedy is approachable and light hearted, fun for anyone. Will appeal to people who like lighthearted comedy and traditional fantasy as themes. Several characters are needlessly added to the roster with no real task in the series at all. The art ranges from average to bad, with the worst offender being the background art.